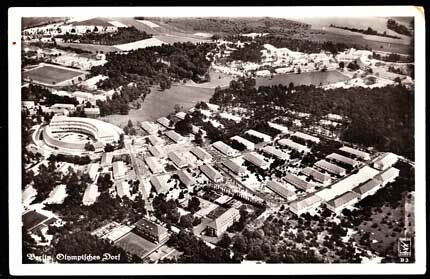 67619 PPC GERMANY (1936) Aerial view of Olympic village. Black & white picture postcard. 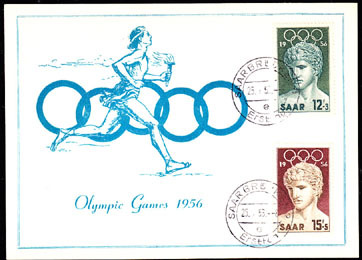 24698 OBL JAPAN (1951) Olympic rings*. Runner* crossing finish line*. 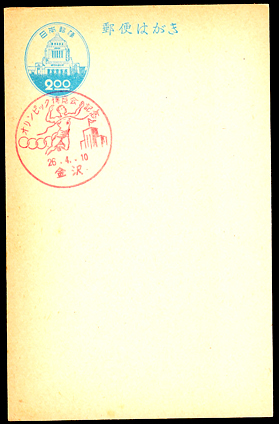 Illustrated commemorative cancellation on 2 yen postal card. 73643 FDC SAAR (1956) Victor of Benevent*. First Day card. Scott Nos B109-10, Yvert Nos 353-4. Melbourne Olympics. 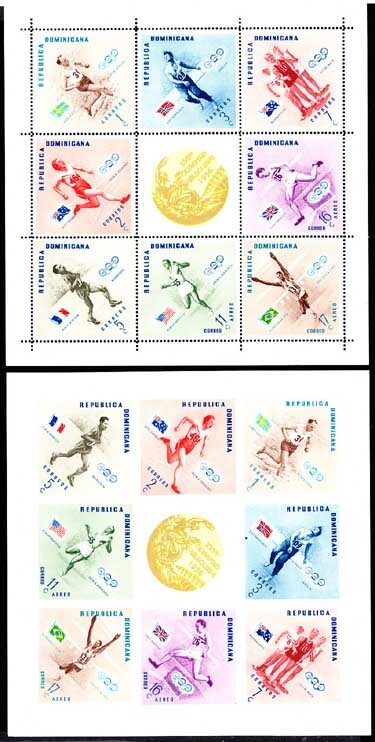 67628 SS DOMINICAN REPUBLIC (1958) Melbourne Olympic winners. Set of 2 S/S of 5, perf + imperf. Scott Nos 501-5. 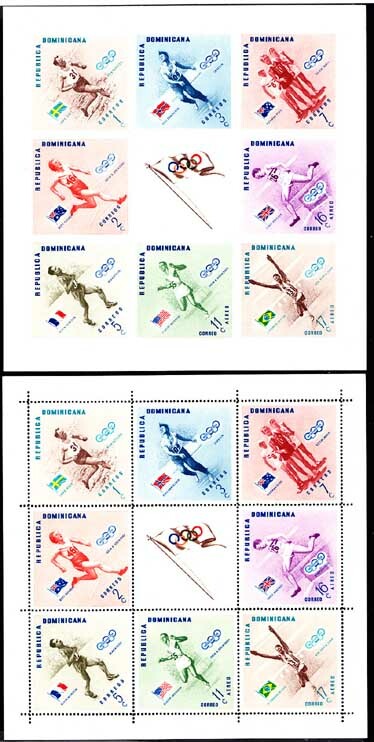 67630 SS DOMINICAN REPUBLIC (1958) Melbourne Olympic winners. Set of 2 S/S of 3, perf + imperf. Scott Nos C106-8. 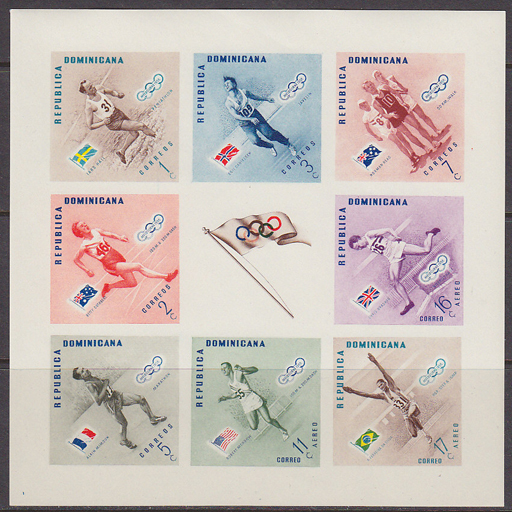 67629 SS DOMINICAN REPUBLIC (1960) Rome Olympics. Set of 2 S/S of 5+label, perf + imperf. Scott Nos 525-9. 62829 ND DOMINICAN REPUBLIC (1960) Wrestling*. Swimming*. High Jump*. Boxing*. Fencing*. Diving*. 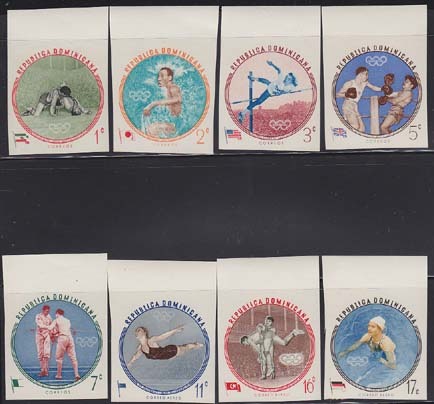 Complete set of 8 imperforate pairs. Rome Olympics. Flags missing on 7c and 11c. Scott Nos 525-9,C115-7. Yvert Nos 542-6,PA146-8. 62830 ND DOMINICAN REPUBLIC (1960) Wrestling*. Swimming*. High Jump*. Boxing*. Fencing*. Diving*. 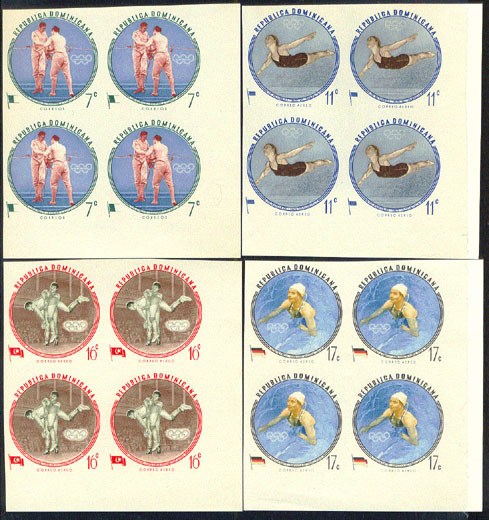 Complete set of 8 imperforates. Rome Olympics. Flags missing on 7c and 11c. Scott Nos 525-9,C115-7. Yvert Nos 542-6,PA146-8. 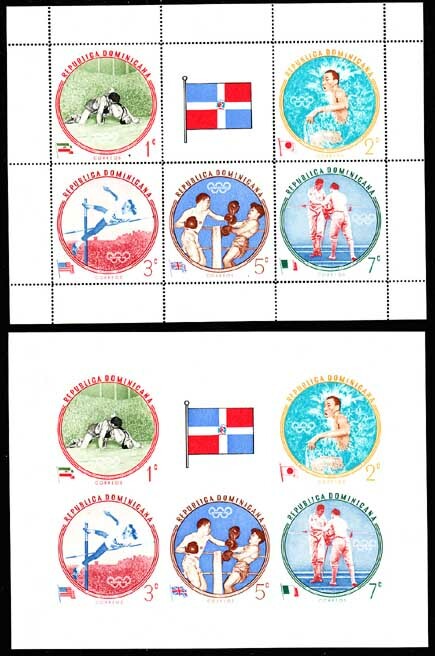 67631 SS DOMINICAN REPUBLIC (1960) Rome Olympics. Set of 2 S/S of 3, perf + imperf. Scott Nos C115-7. 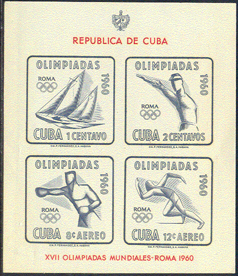 44297 ND CUBA (1960) Rome Olympics*. 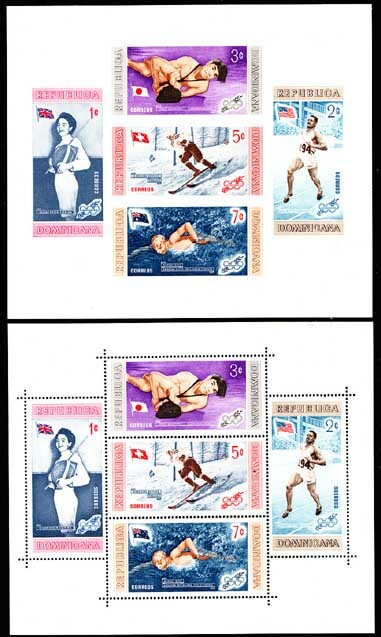 Imperforate S/S. Scott No C213a, Yvert No BF17. 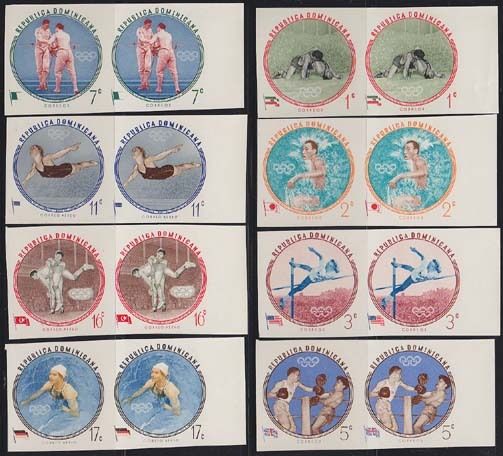 54881 SPE JAPAN (1963) Pole vault*. Tokyo Pre-Olympics*. MIHON (specimen) overprint. Scott No 801. 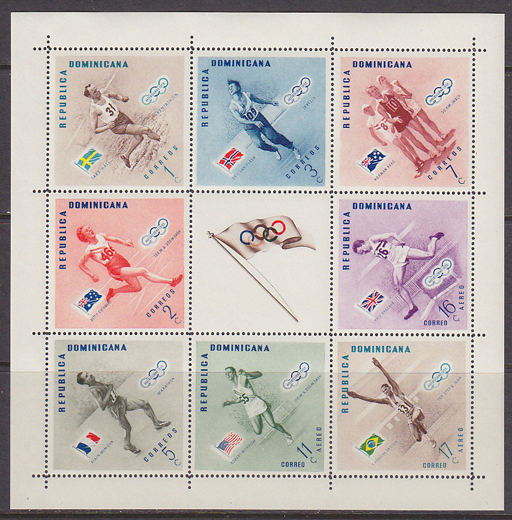 35052 SPE JAPAN (1964) Olympics*. 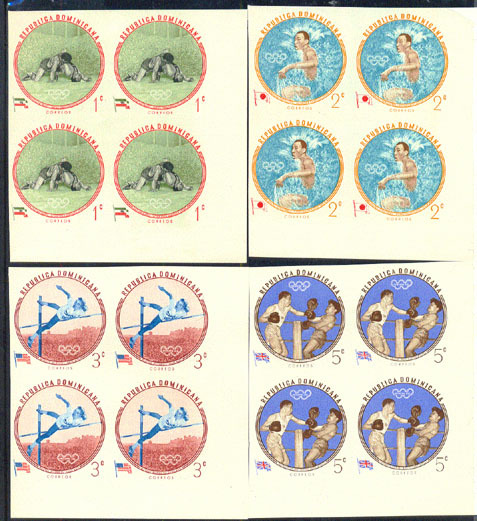 Set of 5 overprinted MIHON (specimen). Scott Nos 821-5, Yvert Nos 783,787-90. Hard to find! 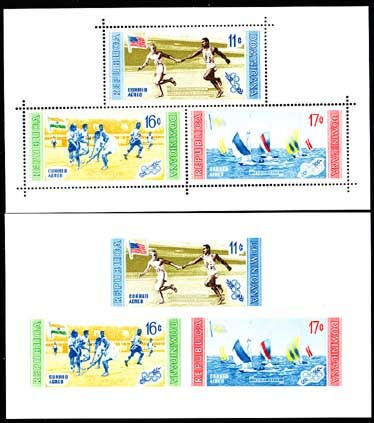 77174 ND BURUNDI (1964) Tokyo Olympics. 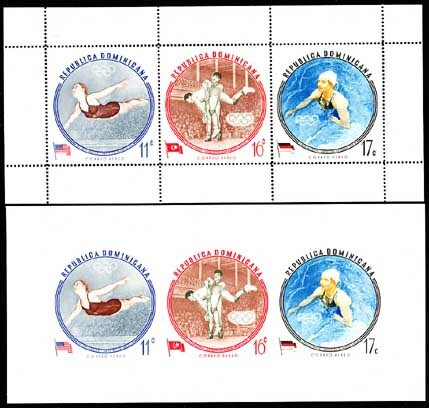 Imperforate S/S. Scott No B8.